We’re gonna find out in this review of DietBet app. Even though we all know that exercising and eating healthily is good for us – we still struggle to find the motivation to do it. What can be a better motivation (besides getting healthier, of course) than money! DietBet app will actually pay you when you lose weight. This is such a good idea, as a lot of people struggle to meet their weight loss goals – but, since there’s the potential to earn cash and to lose cash if you don’t meet your goals, DB really keeps your motivation up. Below, we offer a review that tells you how it works, and how much you can earn with it. So, read on to see if this is the app for you. It’s a website that allows you to make a bet on your own weight loss, alongside other players. It’s a lot like the HealthyWage app (review). Basically, you join a game, which includes a group of other people who are looking to lose weight. Then, each player places money into a virtual pot – this is their bet. You can place a bet as low as $10. Then, whichever players in the group reach their weight loss goals by the end of the time period will split the pot. The pot is essentially the sum of all bets in a diet bet. Download DB for iOS devices here. Download DB for Android devices here. So, you can either download the app, or simply use the website from your computer. Above we mentioned briefly how the program works, but in this section, we’re going to discuss how it works in more detail. When you join DietBet, you can participate in different games to lose weight. There are three game types available. With Kickstarter games, you and the other players are challenged to lose 4% of your bodyweight. You can join an existing game, or start your own challenge with your friends. At the start of the game, each player will put money into the pot. After four weeks, whoever has lost 4% of their body weight will split the pot. Two days before the game begins, you’ll have to submit your official starting weight. While the Kickstarter bet is designed for more short-term weight loss goals, Transformer games are focused on weight loss over a bigger time frame. With this game type, you place a bet to lose 10% of your body weight in 6 months. You can choose to pay your bet monthly, or you can pay the entire bet upfront. If you do this, you play month 6 for free. At the end of the 6 month period, any players who won will split the pot equally. There are also interim goals and prizes available each month to keep you motivated and on track with your weight loss goals. You’ll split each round’s pot, and if you miss a round, then you can still catch up. This is because half of the prizes are spread across the first five rounds, while the other half is divided equally between everyone who reaches the final 10% goal. With the Maintainer, you need to maintain your initial weight for 12 months. There’s a +2% allowance in order to account for daily fluctuations. And, you can also lose up to 4% of your bodyweight. The Maintainer, like the transformer, is broken up into 12 rounds, so you have 12 chances to win. This helps you to stay motivated during the 12 month period. Round 11: Between -4% and +2% to win and within -4% and +5% to qualify for Round 12 – this is mandatory. Round 12: Between -4% and +2% – this is mandatory. If you miss the goal for a round, you can still win the next round or the Grand Prize at the end of round 12. This is because half of the bets are spread across the first 11 rounds, while the other half is divided equally between everyone who wins the Grand Prize at the end of Round 12. While the goals for each round stay the same, your weight needs to be between -4% and +5% of your initial weight by the end of Round 11 to be eligible to win the final pot. This is to ensure that weight loss is done safely, and not rushed right at the end. So, even if you haven’t won any previous rounds, if you weigh in between -4% and +5% of your initial weight by the end of Round 11, then you are still eligible to win Round 12. DietBet has a weigh-in system to ensure that all players are truthful when submitting their weights. This stops other players from cheating. To weigh-in, you’ll need to submit two photos. For one of them, you’ll need to be standing on a scale, wearing lightweight clothing. You’re not allowed to wear shoes, hats, belts, watches, coats or outerwear. The other photo should show the scale’s display of your weight, along with your weigh-in word written on a piece of paper. The weigh-in word is one of the tools the company uses to verify weight loss. This is a time-specific word – so it prevents players from submitting old photos or falsely reporting their weight. So, this word basically acts as a time stamp for when the photo was taken, this means that the word will change depending on when you submit your weight. Also, each weigh-in submission is reviewed by a referee. What’s great about the app is that it has limitations on how much weight you can lose in a certain time period. For example, players can be disqualified for losing more than 12% in any round. Since cutting weight too quickly can be very dangerous, this is a great feature of the app. How much you’ll win depends on the size of the pot, and how many other winners there are in your game. If your game has a large pot, and few winners, then you’ll earn much more, than if your game has a small pot and a lot of winners. According to the company, in Kickstarter games, winners get back 1.5 to 2x their bet, on average. In Transformer games, the winner gets around $325 if they win all 6 rounds or $175 if they win just the final round. So, there is the potential to earn $100s. As I was reading DietBet reviews on Reddit, I came across a lot of personal experience accounts that includes personal accounts of what users have actually won. Shortly after the game ends, your winnings will appear in your account as points. You can either put your points toward a new game, or you can request a payout. You can request a paper check if you want to, but the company charges a $5 fee to cover the cost of writing and mailing it within the US, regardless of the check amount. The company does take a 10% to 25% fee from the payout. The percentage taken depends on the amount of the initial bet. The fees are taken out of the gross pot before any winners receive their money. This means that players who don’t win don’t incur any fees. Aside from money, there are also prizes available. If you complete a verified token weight-in, then you’ll be entered to win that week’s “Surprize.” This is a prize, such as a $100 Amazon Gift card or Fitbit. Rest assured it’s not a scam. And, it also has a rating of 4 out of 5 starts on the iTunes store, and 4.5 out of 5 stars on the Android store. So is DietBet membership worth it? If you’re just looking to make money, then there are easier ways to do it – such as by watching videos through rewards sites like TreasureTrooper or Swagbucks, or by taking surveys. But, if you are looking to lose weight too, then DB is definitely worthwhile. 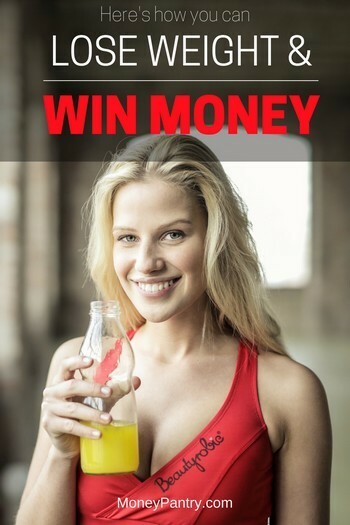 According to the app, 96% of people lose weight, meaning 96% win money! Overall, its users have lost a combined 10,125,204 lbs. and the company has paid out $55,284,596 to winners. Overall, DietBet is an excellent app that gives you a great incentive to lose weight, and it has the potential to earn you money in the process as well. So to end this DietBet review, I’d say give the app a try, and let us know how it works in the comments section.